(ROCKWALL, TX – Nov. 8, 2016) JDog Junk Removal & Hauling, a rapidly growing national company on a mission to offer business ownership opportunities to veterans and their family members, is celebrating one year of business in Rockwall. JDog franchisees provide junk removal and hauling services to both residential and commercial customers, delivering service the military way: with respect, integrity and trust. JDog of Rockwall services the Dallas suburbs, and is owned by husband-and-wife team Derone and Jackie Joplin. Derone enlisted in the U.S. Marine Corps in 1992, then spent more than two decades stationed across the globe, including Japan, Germany and Greece. Joplin completed three combined tours in Iraq and Afghanistan, before finishing his service in the United Arab Emirates as a First Sergeant. A celebration is scheduled for Tuesday, November 15 at 1:20 p.m. at the Rockwall Area Chamber of Commerce, located at 697 East I-30 in Rockwall. JDog awards franchises exclusively to military veterans and their family members. Franchise owners operate easily recognizable, camouflage vehicles and trailers and wear military-style uniforms. JDog recycles and repurposes a substantial amount of the material they pick up. The Philadelphia-based company works closely with local and national organizations, as well as local schools, churches and hospitals to donate useful items to those in need. To schedule a service with the local JDog Junk Removal & Hauling, please call (469) 400-5061. 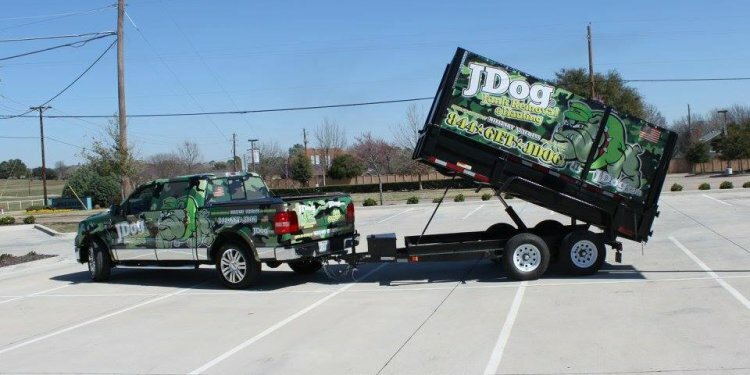 For more information about franchising opportunities with JDog Junk Removal & Hauling, visit jdogjunkremoval.com. JDog Junk Removal & Hauling is a national company that awards franchises exclusively to military veterans and veteran family members – people who understand the notion of service to our country, hard work, and dedication. The company is committed to offering its proven operating model to veterans and military family members, enabling them to realize the American dream of business ownership. JDog is actively looking for qualified franchisees to join the JDog movement nationwide. For more information on JDog Junk Removal & Hauling, please visit jdogjunkremoval.com.